The first T-Mobile Tuesday of February will bring with it another piece of T-Mo Tuesdays swag. 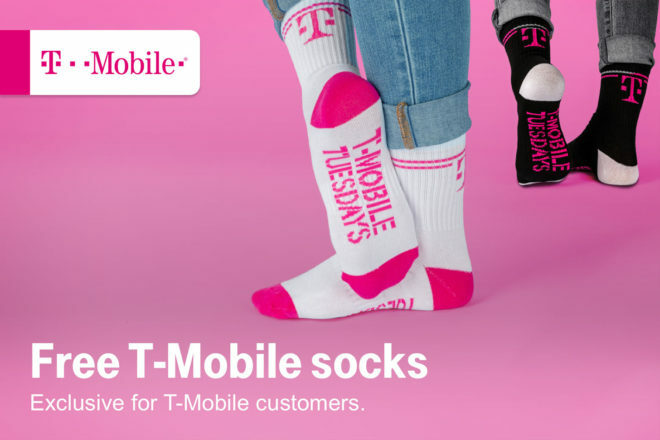 On February 5, T-Mobile customers can get a free pair of T-Mobile Tuesdays socks. This joins previous T-Mo-branded clothing gifts like a hat and gloves combo, a winter hat, and a scarf. T-Mobile customers can also get 10 cents off per gallon of gas from Shell every Tuesday in February. So if you’ve got a vehicle and a Shell nearby, the month of February will help you refuel for less. Rounding out next week’s gifts is $15 off select items plus free standard shipping from 1-800-Flowers. Next Tuesday will also include a grand prize that you have a chance at winning. One winner will receive a $1,000 account credit to Atom Tickets to buy movie tickets. The winner will also get $428 that can be used for taxes or other expenses. I think they should donate free socks to the homeless. So many homeless folks are being exposed to winter elements right now. I’ll probably donate the pair to a clothing drive or hand them off to someone in need. You’re so virtuous. Thank you for sharing. Never. They want more potential subscribers, not fewer! Pretty soon we’ll have a fully free T-Mobile outfit.